Current selected tag: 'desktop'. Clear. If you're one of those people who runs Windows on your Mac, good news: Apple has just released Boot Camp 6, which brings updated drivers and official support for Windows 10 to the company's hardware. New installs of Windows using the Boot Camp Assistant tool should download the new drivers automatically, and those of you performing upgrade installs can use the Windows version of Apple's Software Update tool to download the new drivers before performing the Windows 10 upgrade install. The new Boot Camp update supports all iMacs, Mac Minis, Mac Pros, MacBook Pros, MacBooks Airs, and MacBooks released after 2012; that's not to say that you can't get it working on older Macs, but you're on your own. If that seems a bit stingy, remember that most PC OEMs aren't officially supporting systems older than 2012 either. The Boot Camp software still supports Windows 8.1, too, but official Windows 7 support was dropped back in March. Boot Camp 6 brings new drivers but not many other features—the Boot Camp Control Panel is still barebones, and still uses OS X 10.4-era folder icons. If you want to do anything more complicated than tap-to-click with your multitouch trackpad, you'll need to use a third-party driver like TrackPad++, which actually does do a decent job of supporting Windows 10's new trackpad gestures once you've played with the settings a bit. Otherwise, upgrading from a fully activated version of Windows 7 or 8.x to Windows 10 on a Mac with a Boot Camp partition will work pretty much the same way as it does on a PC, including the oddities involved in getting a new product key and performing clean, properly activated installs. We've been hearing about the death of PCs for years now. The tech world hasn't stopped talking about how devices like smartphones and tablets are cutting into the PC industry's profits, and how mobile is the future. While some of that may be true, that doesn't mean there isn't room to improve the desktop computer as we know it. HP's Sprout is a new type of desktop computer. It was announced in October, but I finally had the chance to see how it works at this year's Consumer Electronics Show. I was a bit skeptical at first. I didn't understand why anyone would need a projector and a giant touchpad with their computer more than a keyboard and mouse. After seeing a demo at Intel's booth, I'm still reluctant to believe we'll start seeing Sprout computers pop up in households around the world. But there's no denying that the technology is impressive, and I could easily see how it could eventually become a game changer for graphic designers, teachers, and students. The Sprout has two components that make it much different than your traditional PC: a 3D scanner/projector, and a touch-enabled mat. You can use a mouse and keyboard with the Sprout at any time; the scanner and touch mat are simply meant to add more to what you can already do with a desktop computer. Based on the short demo I saw at CES, it seems like the technology works incredibly fast. 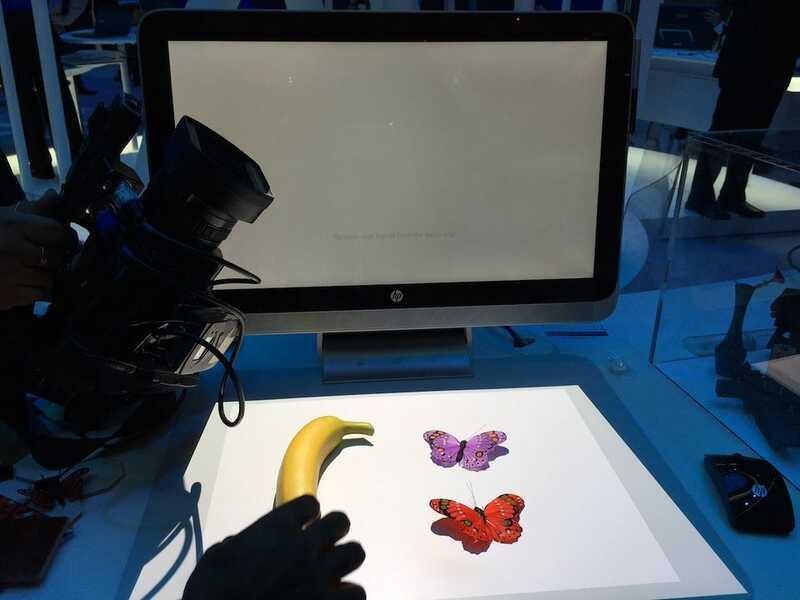 When an Intel representative put a plastic banana on the touch mat, a 3-D rendering of the fruit appeared almost immediately on the screen. Once you scan an object, you can edit it and manipulate it using the touch mat. For example, you can trace over images, layer one image over another, and rotate 3-D images to view scanned objects from different angles. The projector displays content from the computer screen on the touch mat so that you can interact with objects without having to reach out and touch the display. One of the most practical applications seems to be 3-D modeling, but I could also see how it could be used for quickly uploading and editing sketches, documents, and photos. It may not sound very exciting, but seeing the technology firsthand was truly intriguing. 3D scanning isn't new; what impresses me the most about HP's Sprout is the idea that it may be more easily accessible to the everyday computer user. Imagine being able to place any object in front of your computer and have it appear on screen — it seems futuristic when you experience it. If you can't see yourself immediately making use of the Sprout's uncommon features, it's an expensive commitment ($1,900). And it's not perfect yet — Yahoo Tech's David Pogue said some apps that make the best use of the Sprout's scanner and touch mat are slow to open and crash often. At this year's CES, which is supposed to set the stage for the year ahead in tech, Intel emphasized the idea that the traditional keyboard and mouse are getting tired and old. The HP Sprout may be one of the best examples of this mouse-less future Intel envisions, even if it's not quite ready for the mainstream yet.